Will Macron's 'Great National Debate' Help Defuse France's Yellow Vest Unrest? French president Emmanuel Macron takes part in a meeting in Évry-Courcouronnes on Feb. 4. Stung by criticism, and with his government rocked by ongoing protests from yellow vest demonstrators, French President Emmanuel Macron last month launched a nationwide series of community conversations — what his government calls a grand debat national or "great national debate." Since mid-January, groups of mayors, local leaders and ordinary citizens have been meeting to hear and respond to complaints, grievances and suggestions. The public forums are set to continue through March 15. More than 3,000 have been held already, in rural hamlets and big cities. The French president is hoping the meetings will help quell the yellow vest crisis by allowing citizens to express their anger and frustrations. He has promised to take all ideas and suggestions into account for the second half of his term. Macron has personally attended several of these gatherings, and on Monday, visited the town of Évry-Courcouronnes, just south of Paris, for the first meeting in les banlieues, France's troubled suburbs. 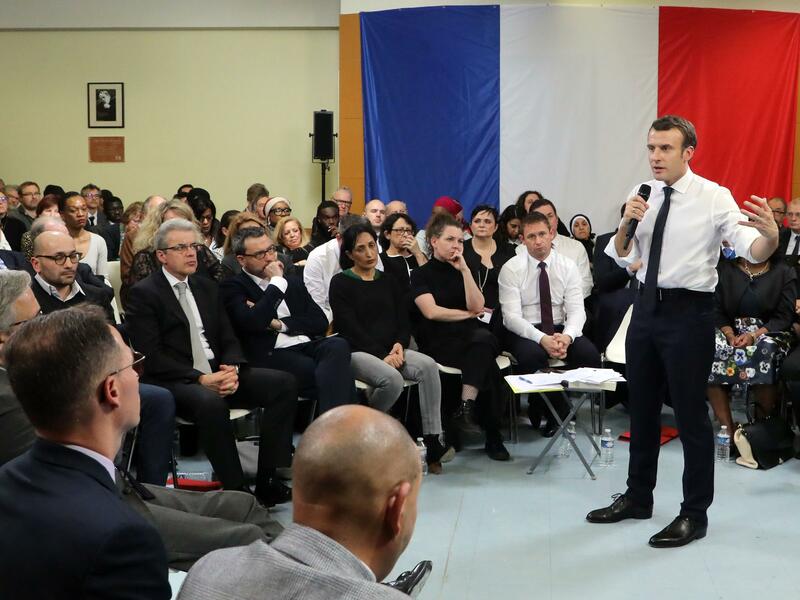 For more than six hours, the French president listened, took notes and responded to complaints and proposals on how to fix the problems people face in les banlieues. About 400 people attended, most of them mayors of small, suburban towns and the directors of local community associations. "I realize there is a rupture in the values of the French Republic when it comes to the suburbs, and the guarantee of equality doesn't always extend to these neighborhoods," Macron told them. He acknowledged the need for change. Anti-riot police walk alongside protesters during an anti-government demonstration called by the yellow vest movement in Marseille on Jan. 26. Unlike in the American sense, where suburbs connote green lawns and ease of life, in France, the term is synonymous with high unemployment, poverty and discrimination. The banlieues that ring large French cities are generally home to immigrants and French citizens of immigrant descent. Removed from the wealth and jobs of the cities, and lacking in public transport, it might seem the suburbs would have grievances in common with the rural yellow-vesters. But the banlieues have not joined the yellow vest movement. Abdallah Abdourahim, who leads a conseil citoyen group that helps people in some of the poorest neighborhoods, says it's almost as if the yellow vest movement made France discover that people are suffering. But those in the suburbs have known it all along. "People in the suburbs have felt on the margins of society for a while and no one's helped them," he says. "So that's why they haven't felt concerned with the yellow vest cause. It's like people are just discovering things that we've been living with, such as police brutality. Now, suddenly the rest of the country is waking up to how the police act." 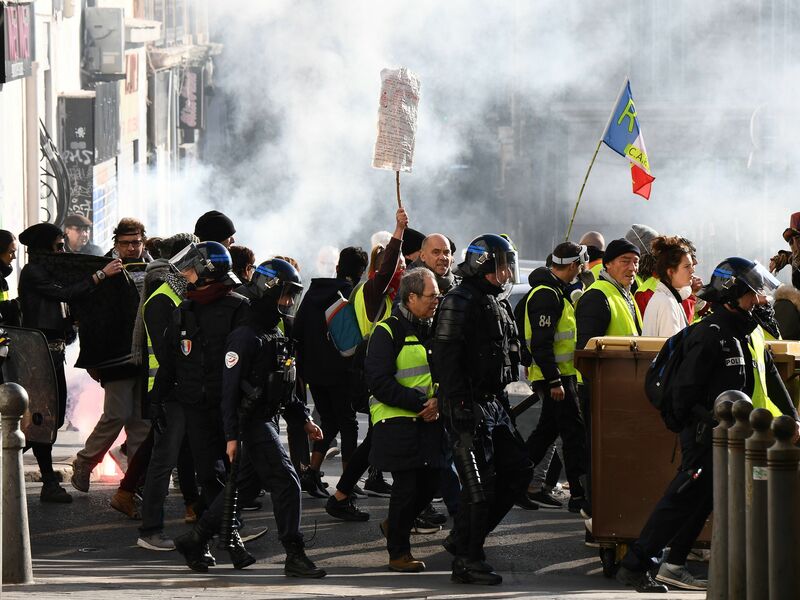 Abdourahim is referring to the scenes of violence between riot police and yellow vest protesters that have played out weekly since the protests began in mid-November. Protesters throw stones and bottles. Police respond with tear gas, rubber bullets and water cannons. Though there is a debate over who is at fault, the demonstrations have shined a light on police brutality. Discrimination is one topic that comes up time and again in Évry-Courcouronnes. People say their chances of finding a job or other opportunities are lower because of their address and their non-French sounding names. That has not been a complaint from the yellow vest movement. 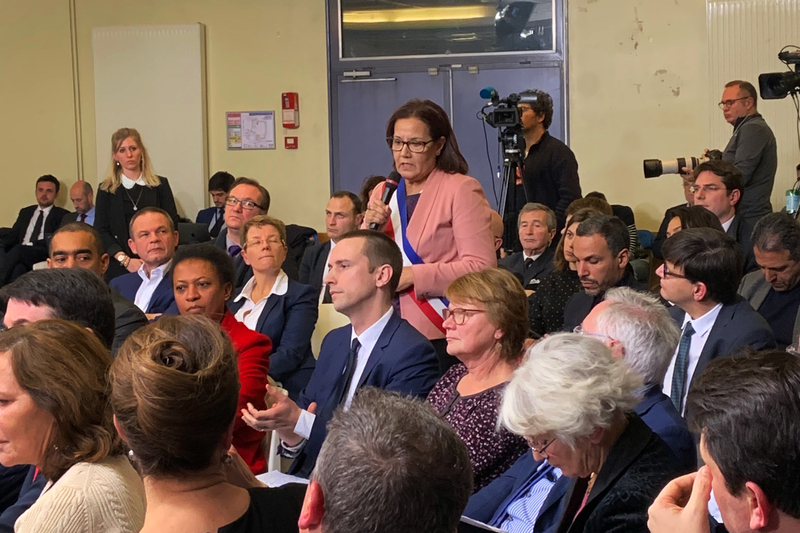 Meriem Derkaoui, the mayor of Aubervilliers, a suburb north of Paris, speaks at Monday's meeting with President Emmanuel Macron. During the meeting, she expressed frustration with delays in a Paris metro extension to her town. "When your name is Muhammed and you come from a poor neighborhood, you don't exactly have the same consideration as when your name is Pierre or Jacques," says Abdourahim. François Durovray, president of the Essonne region where Évry-Courcouronnes is located, says although the rural yellow-vest world and the suburbs have some common problems, they're still very far apart. "It's simple," he says. "The yellow vesters have just started to realize that they've been downgraded — that they don't live anymore as they once did. But the people in the suburbs were born downgraded." The problems of France's suburbs have persisted for decades and successive governments have promised to fix them, but floundered. "A lot of people have given up hope," says Bahran El Fakhar, who heads an association to help youth in the Paris suburb of Chanteloup-les-Vignes. In that suburb, "Forty percent of people under the age of 25 are unemployed," he says. "They don't believe anymore. And we have to fight against this resignation and mistrust." People don't care that Macron promised to raise the minimum wage by 100 euros a month, says Catherine Arenou, the mayor of Chanteloup-les-Vignes, because they don't even earn the minimum wage. In Évry-Courcouronnes, the head of a women's association says there's another reason residents have stayed away from the yellow vest movement. "It's not that the suburbs disagree with the yellow vests' demands," Adolé Ankrah says. "But we didn't want to be blamed for the violence." Ankrah says people from the banlieues are stigmatized and they would have surely been held responsible for shop looting and car burning. She says it's great the president has come to converse with residents of the suburbs, even if the debates weren't originally launched for them. "He's very open and interested," she says. "Macron answers our questions and is open to criticism and suggestions." Macron's popularity, which plummeted late last year as the yellow vest protests erupted, has seen a boost in recent weeks. But Ankrah, like many in France, is wondering if the great national debate will actually produce any results.